Mon - Fri de 08:00-18:00Saturday from 8:00 a 14:00422-2239 / 942-1800 Ext. 1047dralbertogarcia@endoscopiamerida.mxCalle 32 No. 242, García GinerésMérida, Yucatán. 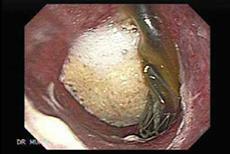 The extraction of foreign bodies is the second most frequent indication for performing an urgent high digestive endoscopy. The need for endoscopic extraction or the possibility of letting them evolve freely is fundamentally defined by the location and characteristics of the foreign body. As a general rule we must remove all the bodies located in the esophagus and assess the need for the extraction of the gastrics.